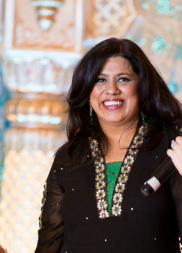 Choonri Collection was founded by Seema Kapoor in 1990 and has served the New England Indian community for over a decade. The Groom's Collection emphasizes sharp tailoring in rich textures and colors coordinated with the women wear. Jackets, Sherwanis and embroidered Jodhpuris are worn with embellished trousers. We have our in-house team of highly skilled craftsmen as well as a strong network of artisans proficient in Indian embroidery and other embellishment techniques.Our greatest strength is our open attitude for learning and reinventing techniques and textures.For a clothing enthusiast seeking variety,innovation,quality and dependability Choonri is a perfect choice. We also offer custom tailored pieces, designer clothing, and fashion accessories that reflect Indian culture. At your consultation we will show you our existing portfolio, range of fabric swatches, color chart, and embroidery designs to discuss your idea and make suggestions based on our experience and sense of style. Our products have been widely appreciated by our clients. Our dresses have been featured in the movie, 27 Dresses. We work with the vision of long standing associations with our clients and we have been able to procure repeated orders from our distinguished clients by designing our products exactly as per their specific requirements. We are proud to offer our customer quality designs at affordable price.